Restylane® was the first hyaluronic acid injectable dermal filler used in the U.S. and has been safely used in more than 2 million treatments in the U.S. Now there are five different types of Restylane®, each designed for specific areas or goals. All of the Restylane® dermal fillers are made of hyaluronic acid, a clear gel-like substance that is found naturally in the body, so there's very little chance of allergic reactions. They also all contain anesthetic, to diminish discomfort during treatments. Dr. Elliott uses the original formulation of Restylane® to lift depressions under the eyes (also known as "troughs") that cause dark circles, smooth noses that have a bump, and plump up creased or tired ear lobes (when stud earrings are looking at the floor). Original Restylane results typically last six to nine months on average, but can last much longer when used to fill depressions under the eyes. 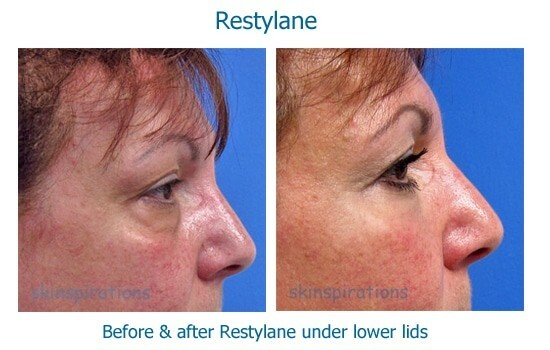 Restylane® Lyft (previously named Perlane) is a gel with a firmer consistency than the original Restylane, so it's used to provide both a lifting effect as well as volume replacement. It's a good dermal filler choice for cheek, chin or jawline enhancement, or for lifting sagging facial skin. 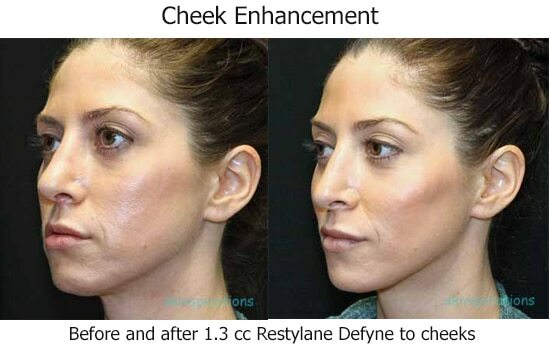 Results from Restylane® Lyft last nine to twelve months, on average. Restylane® Refyne & Restylane Defyne are the two newest Restylane fillers approved in the U.S. but have been safely used in Europe since 2010 under the brand name, Emervel. What’s unique about them is that they’re flexible & stretch under the skin with facial expressions, so that whether you’re laughing or frowning, they’re not visible under the skin. This makes them especially helpful for areas with muscles that pull the skin in multiple directions, like around the mouth. Both Defyne & Refyne results last about twelve months so many patients will get a touch up after about nine months to maintain their improvement. Restylane® Refyne is a thin, stretchable filler so it can be used both closer to the surface of the skin than Lyft or Defyne, and also deeper. This makes it an excellent choice for lip, forehead, crow's feet, and smoker's lines, as well as the marionette areas, outside the corners of the mouth & in the lips. 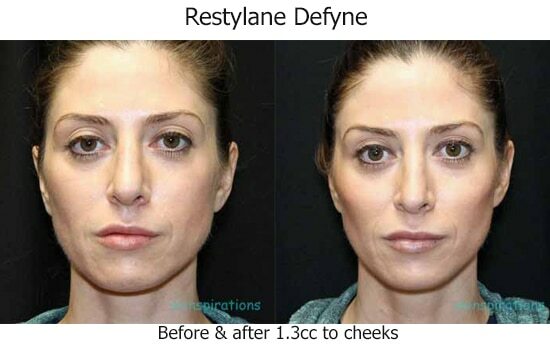 Restylane® Defyne is a medium thickness filler so it’s used to fill deeper lines like marionettes (sad mouth lines) and nasolabial (nose to mouth corner lines) folds. Restylane®Silk is a soft, thin gel that can be used for filling fine lines like smoker's lines around the lips and crow's feet, with results lasting about six months on average. The price of any cosmetic medical treatment reflects not only the cost of the product but also the skill and experience of the provider, and value of the time required for the treatment. Skinspirations' practitioners are recognized for being in the top 1% in the nation for injection skill and experience, so you know you'll get the best results possible. All Restylane® treatments are priced at $600 for the 1st syringe and discounted 15% when 2 syringes are used, 20% for 3, and 25% off when 4 or more syringes of any filler are used during a session. Get valuable discounts & rebates when you purchase Restylane & other Galderma products, by signing up for the Aspire Rewards Program. Call our office at (727) 571.1923 for a complimentary consultation to learn more about how we can help you achieve the look you desire.